It’s a new way that people and companies can create, verify, and enforce value-based transactions, and offers a safe, secure, and transparent way to negotiate and transact in real time without paying for a middleman. Because each transaction is immutable, encrypted, and protected by permissions, no one else can tamper with it. Most early adopters are large businesses that are using blockchain to accept cryptocurrencies, but cloud-based providers are embedding blockchain capabilities into small business solutions. Intuit has already enabled QuickBooks to accept cryptocurrency payments. Because the blockchain eliminates the payment processor from the transaction, small businesses can save money on processing fees. 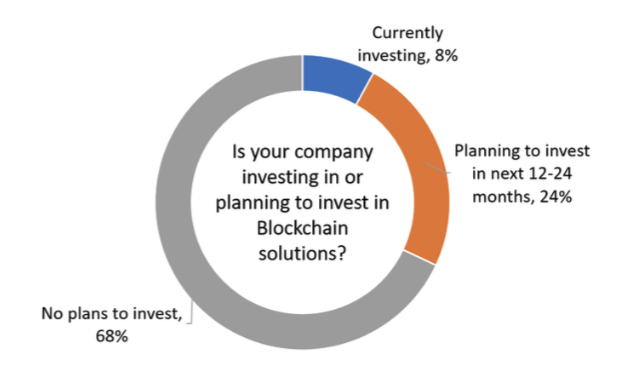 Since blockchain is still in the very early stages, most small businesses don’t yet understand it, and only 8% are currently using it. As vendors add new blockchain capabilities to their applications, small businesses will see new ways to use and benefit from it. Some developments to watch for include “smart contracts” for things such as real estate transactions, loans, and financing, and the ability to identity verification to code a person’s information, so his or her identity can be verified before that person is allowed to access a digital entry point, like a paywall on your website. What are your biggest hesitations with adopting blockchain in your small business? Let us know in the comments!